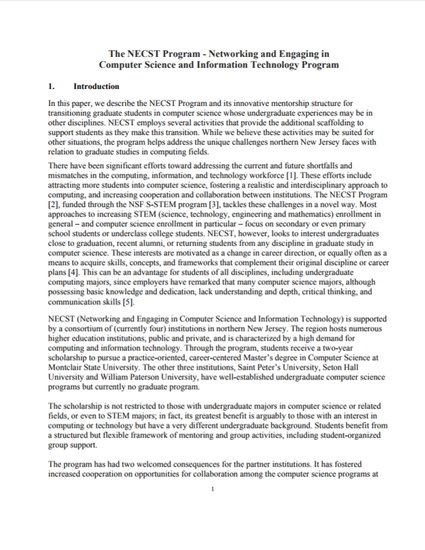 In this paper, we describe the NECST Program and its innovative mentorship structure for transitioning graduate students in computer science whose undergraduate experiences may be in other disciplines. NECST employs several activities that provide the additional scaffolding to support students as they make this transition. While we believe these activities may be suited for other situations, the program helps address the unique challenges northern New Jersey faces with relation to graduate studies in computing fields. © 2017, American Society for Engineering Education, Proceedings of ASEE Annual Conference, Columbus, Ohio.